Well, I’ve been thinking a lot lately about single board computers. There’s a big market out there. Since the Raspberry Pi, there’s been a real explosion available to the small-end of town, the individual. Prior to this, development boards were mostly in the 4-figures sort of price range. So we’re now rather spoiled for choice. I have a Raspberry Pi. There’s also the BeagleBone Black, Banana Pi, and several others. One gripe I have with the Raspberry Pi is the complete absence of any kind of analogue input. There’s an analogue line out, you can interface some USB audio devices (although I hear two is problematic), or you can get an I2S module. There’s a GPU in there that’s capable of some DSP work and a CLKOUT pin that can generate a wide range of frequencies. That sounds like the beginnings of a decent SDR, however one glitch, while I can use the CLKOUT pin to drive a mixer and the GPIOs to do band selection, there’s nothing that will take that analogue signal and sample it. If I want something wider than audio frequencies (and even a 192kHz audio CODEC is not guaranteed above ~20kHz) I have to interface to SPI, and the pickings are somewhat slim. Then I read this article on a DIY single board computer. That got me thinking about whether I could do my own. At work we use the Technologic Systems TS-7670 single-board computers, and as nice as those machines are, they’re a little slow and RAM-limited. Something that could work as a credible replacement there too would be nice, key needs there being RS-485, Ethernet and a 85 degree temperature rating. Form factor is a consideration here, and I figured something modular, using either header pins or edge connectors would work. That would make the module easily embeddable in hobby projects. Since all the really nice SoCs are BGA packages, I figured I’d first need to know how easy I could work with them. We’ve got a stack of old motherboards sitting in a cupboard that I figured I could raid for BGAs to play with, just to see first-hand how fine the pins were. A crazy thought came to me: maybe for prototyping, I could do it dead-bug style? 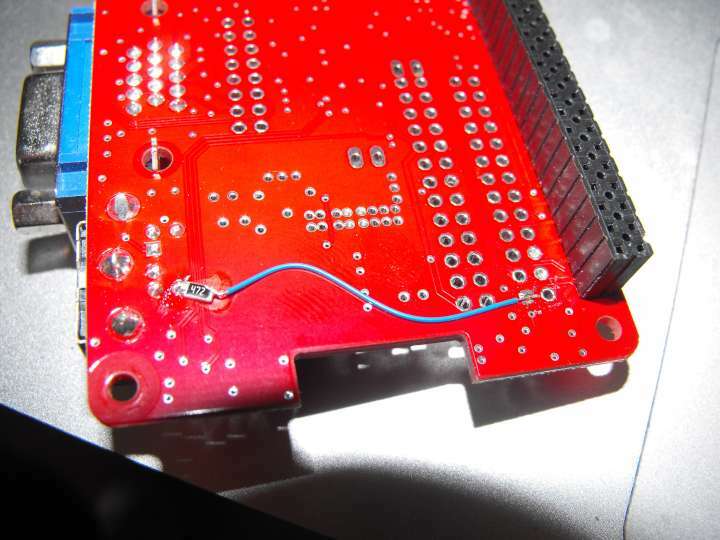 Key thing here being able to solder directly to a ball securely, then route the wire to its destination. I may need to glue it to a bit of grounded foil to keep the capacitance in check. So, the first step I figured, would be to try removing some components from the boards I had laying around to see this first-hand. In amongst the boards I came across was one old 386 motherboard that I initially mistook for a 286 minus the CPU. The empty (PLCC) socket is for an 80387 math co-processor. 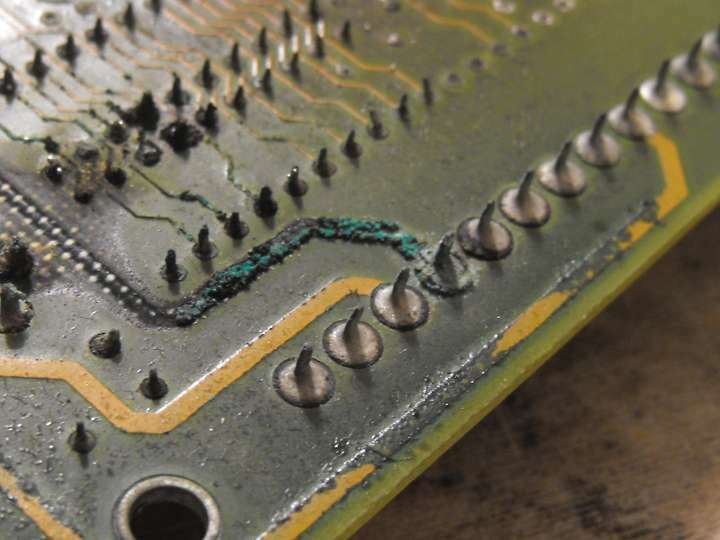 The board was in the cupboard for a good reason, corrosion from the CMOS battery had pretty much destroyed key traces on one corner of the board. I decided to take to it with the heat gun first. The above picture was taken post-heatgun, but you can see just how bad the corrosion was. 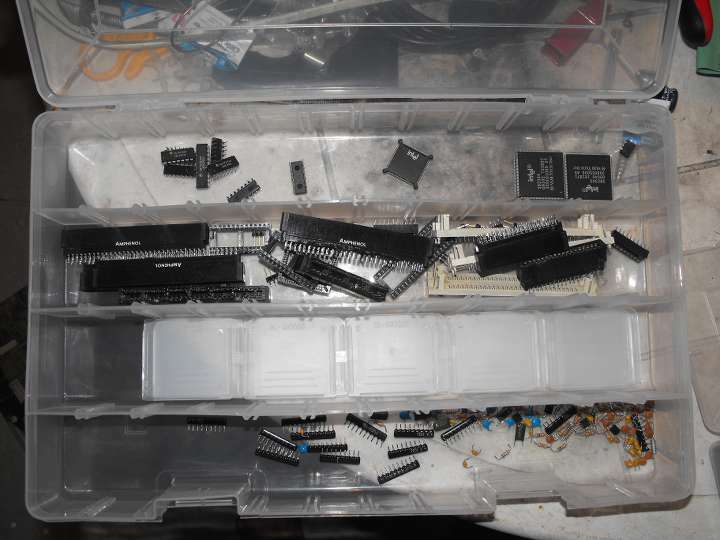 The ISA slots were okay, and so where a stack of other useful IC sockets, ICs, passive components, etc. With the heat gun at full blast, I’d just wave it over an area of interest until the board started to de-laminate, then with needle-nose pliers, pull the socket or component from the board. Sometimes the component simply dropped out. At one point I heard a loud “plop”. Looking under the board, one of the larger surface-mounted chips had fallen off. That gave me an idea, could the 386 chip be de-soldered? I aimed the heat-gun directly at the area underneath. A few seconds later and it too hit the deck. All in all, it was a successful haul. The question comes up, what does one do with a crusty old 386 that’s nearly as old as I am? 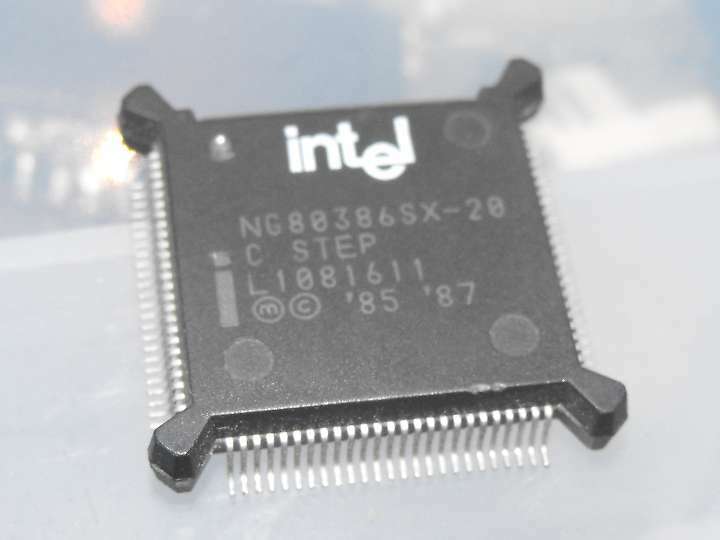 A quick search turned up this scanned copy of the Intel 80386SX datasheet. The chip has a 16-bit bus with 23 bits worth of address lines (bit 0 is assumed to be zero). It requires a clock that is double the chip’s operating frequency (there’s an internal divide-by-two). This particular chip runs internally at 20MHz. Nothing jumped out as being scary. Could I use this as a practice run for making an ARM computer module? an SST 29EE010-150-3C-PH 1Mbit (128k×8bit) flash chip (with on-board Vpp generator). an Intel P28F001BXT150 1Mbit (128k×8bit) flash chip (without on-board Vpp generator). an AMI Keyboard BIOS chip. a National Semiconductor NM27C512Q150 512kbit (64k×8bit) UV-erasable EPROM. 10 Toshiba TC55328P-20 256kbit (32k×8bit) SRAM chips. 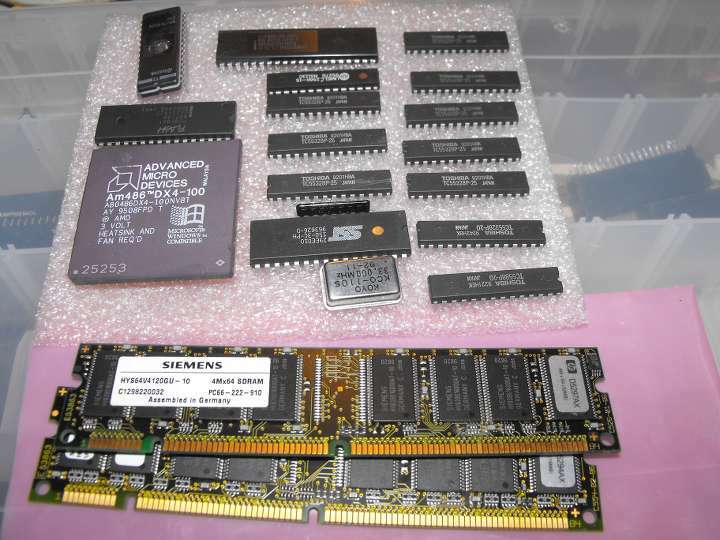 two Siemens HYS64V4120GU-10 32MB (4M×64bit) PC66 SDRAM modules. the SDRAM modules a 3.3V, the CPU is 5V: no problem, there are level conversion chips out there. the SDRAM modules are 64-bits wide. We’ll have to buffer the output to eight 8-bit registers. Writes do a read-modify-write cycle, and we use a 2-in-4 decoder to select the CE pin on two of the registers from address bits 1 and 2 from the CPU. So, not show stoppers. There’s an example circuit showing interfacing an ATMega8515 to a single SDRAM chip for driving a VGA interface, and some example code, with comments in German. Unfortunately you’d learn more German in an episode of Hogan’s Heroes than what I know, but I can sort-of figure out the sequence used to read and write from/to the SDRAM chip. Nothing looks scary there either. This SDRAM tutorial seems to be a goldmine. Thus, it looks like I’ve got enough bits to have a crack at it. I can run the 386 from that 33MHz brick; which will give me a chip running at 16.5MHz. Somewhere I’ve got the 40MHz brick laying around from the motherboard (I liberated that some time ago), but that can wait. A first step would be to try interfacing the 386 chip to an AVR, and feed it instructions one step at a time, check that it’s still alive. Then, the next steps should become clear. Well, lately I’ve been doing a bit of work hacking the firmware on the Rowetel SM1000 digital microphone. For those who don’t know it, this is a hardware (microcontroller) implementation of the FreeDV digital voice mode: it’s a modem that plugs into the microphone/headphone ports of any SSB-capable transceiver and converts FreeDV modem tones to analogue voice. I plan to set this unit of mine up on the bicycle, but there’s a few nits that I had. If there’s no timeout timer, I really need to hear the tones coming from the radio to tell me it has timed out. Others might find a VOX feature useful, and there’s active experimentation in the FreeDV 700B mode (the SM1000 currently only supports FreeDV 1600) which has been very promising to date. Long story short, the unit needed a more capable UI, and importantly, it also needed to be able to remember settings across power cycles. There’s no EEPROM chip on these things, and while the STM32F405VG has a pin for providing backup-battery power, there’s no battery or supercapacitor, so the SM1000 forgets everything on shut down. ST do have an application note on their website on precisely this topic. AN3969 (and its software sources) discuss a method for using a portion of the STM32’s flash for this task. However, I found their “license” confusing. So I decided to have a crack myself. How hard can it be, right? The flash is organised into sectors. These sectors when erased contain nothing but ones. We store data by programming zeros. The only way to change a zero back to a one is to do an erase of the entire sector. The sector may be erased a limited number of times. It should keep tabs on what parts of the sector are in use. For simplicity, we’ll divide this into fixed-size blocks. When a block of data is to be changed, if the change can’t be done by changing ones to zeros, a copy of the entire block should be written to a new location, and a flag set (by writing zeros) on the old block to mark it as obsolete. When a sector is full of obsolete blocks, we may erase it. We try to put off doing the erase until such time as the space is needed. The first step is to make room for the flash variables. They will be directly accessible in the same manner as variables in RAM, however from the application point of view, they will be constant. In many microcontroller projects, there’ll be several regions of memory, defined by memory address. This comes from the datasheet of your MCU. We need at least two sectors, as when one fills up, we will swap over to the other. Now it would have been nice if the arrangement were reversed, with the smaller sectors at the end of the device. The Cortex M4 CPU is basically hard-wired to boot from address 0, the BOOT pins on the STM32F4 decide how that gets mapped. The very first few instructions are the interrupt vector table, and it MUST be the thing the CPU sees first. Unless told to boot from external memory, or system memory, then address 0 is aliased to 0x08000000. i.e. flash sector 0, thus if you are booting from internal flash, you have no choice, the vector table MUST reside in sector 0. Normally code and interrupt vector table live together as one happy family. We could use a couple of 128k sectors, but 256k is rather a lot for just an EEPROM storing maybe 1kB of data tops. Two 16kB sectors is just dandy, in fact, we’ll throw in the third one for free since we’ve got plenty to go around. However, the first one will have to be reserved for the interrupt vector table that will have the space to itself. There’s rather a lot here, and so I haven’t reproduced all of it, but this is the same file as before at revision 2389, but a little further down. You’ll note the .isr_vector is pointed at the region called FLASH which is most definitely NOT what we want. The image will not boot with the vectors down there. We need to change it to put the vectors in the VECTOR region. Whilst we’re here, we’ll create a small region for the EEPROM. We have to do two things. One, is we need to tell it that we want the region filled with the pattern 0xff. Two, we need to make sure it gets filled with ones by telling the linker to write one as the very last byte. Otherwise, it’ll think, “Huh? There’s nothing here, I won’t bother!” and leave it as a string of zeros. Give some thought as to what data you’ll be storing. This will decide how big to make the blocks. If you’re storing only tiny bits of data, more blocks makes more sense. If however you’ve got some fairly big lumps of data, you might want bigger blocks to reduce overheads. I ended up dividing the sectors into 256-byte blocks. I figured that was a nice round (binary sense) figure to work with. At the moment, we have 16 bytes of configuration data, so I can do with a lot less, but I expect this to grow. The blocks will need a header to tell you whether or not the block is being used. Some checksumming is usually not a bad idea either, since that will clue you in to when the sector has worn out prematurely. So some data in each block will be header data for our virtual EEPROM. If we don’t care about erase cycles, this is fine, we can just make all blocks data blocks, however it’d be wise to track this, and avoid erasing and attempting to use a depleted sector, so we need somewhere to track this. 256 bytes gives us enough space to stash an erase counter and a map of what blocks are in use within that sector. So we’ll reserve the first block in the sector to act as this index for the entire sector. This gives us enough room to have 16-bits worth of flags for each block stored in the index. That gives us 63 blocks per sector for data use. So that subtracts 8 bytes from the 256 bytes, leaving us 248 for actual program data. If we want to store 320 bytes, we use two blocks, block index 0 stores bytes 0…247 and has a size of 248, and block index 1 stores bytes 248…319 and has a size of 72. When the sector is erased, all blocks show up as having all flags set as ones, so the flags is considered “inverted”. When we come to use a block, we mark the “in use” bit with a zero, leaving the rest as ones. When we erase, we mark the entire flags block as zeros. We can set other bits here as we need for accounting purposes. Thus we have now a format for our flash sector header, and for our block headers. We can move onto the algorithm. This is good enough if the size of a ROM image doesn’t change (normal case). For flexibility, I made my code so that it works crudely like a file, you can seek to any point in the ROM image and start reading/writing, or you can blow the whole thing away. Our programming environment may also define some, for example UINTx_MAX. The amount of data per block. I decided to use the STM32’s CRC module for this, which takes its data in 32-bit words. There’s also the complexity of checking the contents of a structure that includes its own CRC. I played around with Python’s crcmod module, but couldn’t find some arithmetic that would allow it to remain there. So I copy the entire block, headers and all to a temporary copy (on the stack), set the CRC field to zero in the header, then compute the CRC. Since I need to read it in 32-bit words, I pack 4 bytes into a word, big-endian style. In cases where I have less than 4 bytes, the least-significant bits are left at zero. We identify each block in an image by the ROM ID and the block index. We need to search for these when requested, as they can be located literally anywhere in flash. There are probably cleverer ways to do this, but I chose the brute force method. We cycle through each sector and block, see if the block is allocated (in the index), see if the checksum is correct, see if it belongs to the ROM we’re looking for, then look and see if it’s the right index. To read from the above scheme, having been told a ROM ID (rom), start offset and a size, the latter two being in byte sand given a buffer we’ll call out, we first need to translate the start offset to a sector and block index and block offset. This is simple integer division and modulus. The first and last blocks of our read, we’ll probably only read part of. The rest, we’ll read entire blocks in. The block offset is only relevant for this first block. So we start at the block we calculate to have the start of our data range. If we can’t find it, or it’s too small, then we stop there, otherwise, we proceed to read out the data. Until we run out of data to read, we increment the block index, try to locate the block, and if found, copy its data out. Writing is a similar affair. We look for each block, if we find one, we overwrite it by copying the old data to a temporary buffer, copy our new data in over the top then mark the old block as obsolete before writing the new one out with a new checksum. Trickery is in invoking the wear levelling algorithm on an as-needed basis. We mark a block obsolete by setting its header fields to zero, but when we run out of free blocks, then we go looking for sectors that are full of obsolete blocks waiting to be erased. When we encounter a sector that has been erased, we write a new header at the start and proceed to use its first data block. In the case of erasing, we don’t bother writing anything out, we just mark the blocks as obsolete. The full C code is in the Codec2 Subversion repository. For those who prefer Git, I have a git-svn mirror (yes, I really should move it off that domain). The code is available under the Lesser GNU General Public License v2.1 and may be ported to run on any CPU you like, not just ST’s. I’ve been running a station from the bicycle for some time now and I suppose I’ve tried a few different battery types on the station. Originally I ran 9Ah 12V gel cells, which work fine for about 6 months, then the load of the radio gets a bit much and I find myself taking two with me on a journey to work because one no longer lasts the day. I replaced this with a 40Ah Thundersky LiFePO4 pack which I bought from EVWorks, which while good, weighed 8kg! This is a lot lighter than an equivalent lead acid, gel cell or AGM battery, but it’s still a hefty load for a bicycle. At the time that was the smallest I could get. Eventually I found a mob that sold 10Ah packs. These particular cells were made by LiFeBatt, and while pricey, I’ve pretty much recouped my costs. (I’d have bought and disposed of about 16 gel cell batteries in this time at $50 each, versus $400 for one of these.) These are what I’ve been running now since about mid 2011, and they’ve been pretty good for my needs. They handle the load of the FT-857 okay on 2m FM which is what I use most of the time. A week or two back though, I was using one of these packs outside with the home base in a “portable” set-up with my FT-897D. Tuned up on the 40m WICEN net on 7075kHz, a few stations reported that I had scratchy audio. Odd, the radio was known to be good, I’ve operated from the back deck before and not had problems, what changed? The one and only thing different is I was using one of these 10Ah packs. I’ve had fun with RF problems on the bicycle too. On transmit, the battery was hovering around the 10.2V mark, perhaps a bit low. Could it be the radio is distorting on voice peaks due to input current starvation? I tried after the net swapping it for my 40Ah pack, which improved things. Not totally cleared up, but it was better, and the pack hadn’t been charged in a while so it was probably a little low too. I thought about the problem for a bit. SSB requires full power on voice peaks. For a 100W radio, that’s a 20A load right now. Batteries don’t like this. Perhaps there was a bit of internal resistance from age and the nature of the cells? Could I do something to give it a little hand? 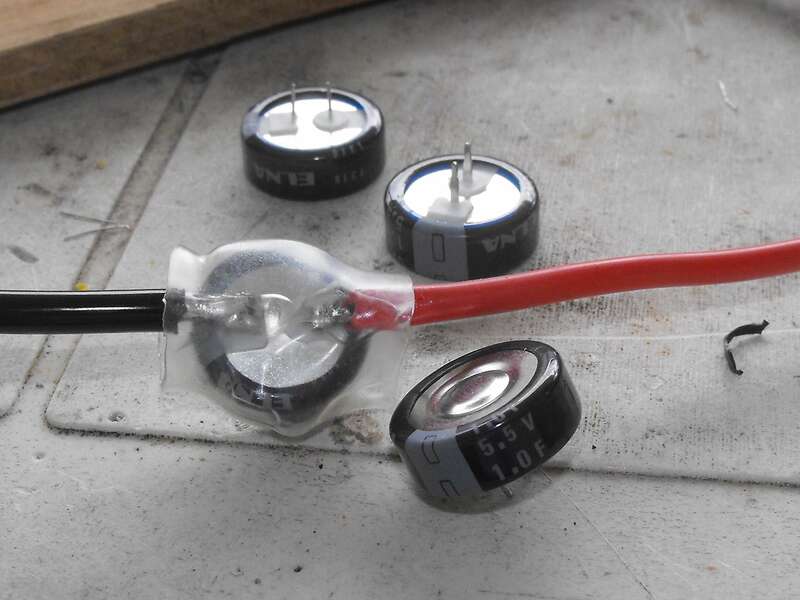 Supercapacitors are basically very high capacity electrolytic capacitors with a low breakdown voltage, normally in the order of a few volts and capacitances of over a farad. They are good for temporarily storing charge that needs to be dumped into a load in a hurry. Could this help? 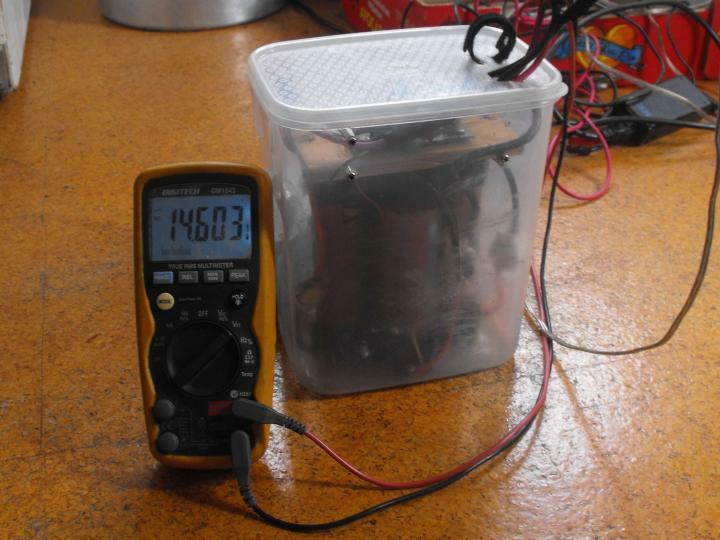 My cells are in a series bank of 4: ~3.3V/cell with 4 cells gives me 13.2V. There’s a battery balancer already present. If a cell gets above 4V, that cell is toast, so the balancer is present to try to prevent that from happening. I could buy these 1F 5.5V capacitors for only a few dollars each, so I thought, “what the hell, give it a try”. I don’t have much information on them other that Elna Japan made them. 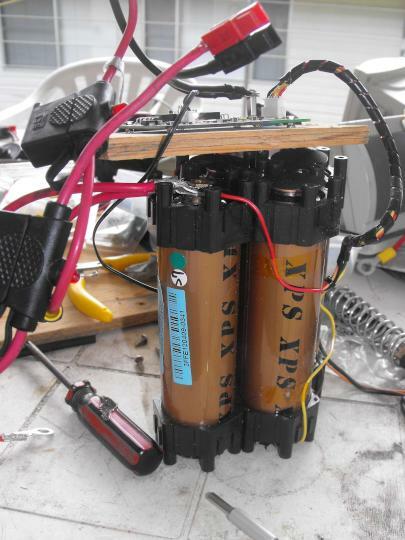 The plan was to make some capacitor “modules” that would hook in parallel to each cell. For my modules, the construction was simple, two reasonably heavy gauge wires tacked onto the terminals, the whole capacitor then encased in heatshrink tubing and ring lugs crimped to the leads. I was wondering whether I should solder a resistor and diode in parallel and put that in series with the supercap to prevent high in-rush current, but so far that hasn’t been necessary. I’ve put the pack back together and so far, it has charged up and is ready to face its first post-retrofit challenge. I guess I’ll be trying out the HF station tomorrow to see how it goes. Not a complete solution to the RF feedback, it seems to help in other ways. I did a quick test on the drive way first with the standard Yaesu handmic and with the headset. Headset still faces interference problems on HF, but I can wind it up to about 30W~40W now instead of 20. More pondering to come but we’ll see what the other impacts are. I’ve been riding on the road now for some years, and while I normally try to avoid it, I do sometimes find myself riding on the road itself rather than on the footpath or bicycle path. Most of the time, the traffic is fine. I’m mindful of where everyone is, and there aren’t any problems, but I have had a couple of close calls from time to time. Close calls that have me saying “ode for a horn”. By law we’re required to have a bell on our bikes. No problem there, I have a mechanical one which is there purely for legal purposes. If I get pulled over by police, and they ask, I can point it out and demonstrate it. Requirement met? Tick to that. It’s of minimal use with pedestrians, and utterly useless in traffic. Early on with my riding I developed a lighting system which included indicators. Initially this was silent, I figured I’d see the lights flashing, but after a few occasions forgetting to turn indicators off, I fitted a piezo buzzer. This was an idea inspired by the motorcycles ridden by Australia Post contractors, which have a very audible buzzer. Jaycar sell a 85dB buzzer that’s waterproof, overkill in the audio department but fit for purpose. It lets me know I have indicators on and alerts people to my presence. That is, if they equate the loud beep to a bicycle. Some do not. And of course, it’s still utterly useless on the road. I figured a louder alert system was in order. Something that I could adjust the volume on, but loud enough to give a pedestrian a good 30 seconds warning. That way they’ve got plenty of time to take evasive action while I also start reducing speed. It’s not that I’m impatient, I’ll happily give way, but I don’t want to surprise people either. Drivers on the other hand, if they do something stupid it’d be nice to let them know you’re there! My workplace looks after a number of defence bases in South-East Queensland, one of which has a railway crossing for driver training. This particular boom gate assembly copped a whack from a lightning strike, which damaged several items of equipment, including the electronic “bells” on the boom gate itself. These “bells” consisted of a horn speaker with a small potted PCB mounted to the back which contained an amplifier and bell sound generator. Apply +12V and the units would make a very loud dinging noise. That’s in theory; in practise, all that happened was a TO-220 transistor got hot. Either the board or the speaker (or both) was faulty. It was decided these were a write-off, and after disassembly I soon discovered why: the voice coils in the horn speakers had been burnt out. A little investigation, and I figured I could replace the blown out compression drivers and get the speakers themselves working again, building my own horn. A concept formed: the horn would have two modes, a “bell” mode with a sound similar to a bicycle bell, and a “horn” mode for use in traffic. I’d build the circuit in parts, the first being the power amplifier then interface to it the sound effect generator. Obviously it’d be ideal to replace it with the correct part, but looking around, I couldn’t see anything that would fit the housing. That, and what I did see, was more expensive than buying a whole new horn speaker. There was a small aperture in the back about 40mm in diameter. The original drivers were 8ohms, and probably rated at 30W and had a convex diaphragm which matched the concave geometry in the back of the horn assembly. Looking around, I saw these 2W mylar cone speakers. Not as good as a compression driver, but maybe good enough? It was cheap enough to experiment. I bought two to try it out. I got them home, tacked some wires onto one of them and plugged it into a radio. On its own, not very loud, but when I held it against the back of a horn assembly, the amplification was quite apparent. Good enough to go further. I did some experiments with how to mount the speakers to the assembly, which required some modifications to be made. I soon settled on mounting the assembly to an aluminium case with some tapped holes for clamping the speaker in place. There was ample room for a small amplifier which would be housed inside the new case, which would also serve as a means of mounting the whole lot to the bike. I wasn’t sure what to use for this, I had two options: build an analogue circuit to make the effect, or program a microcontroller. I did some experiments with an ATMega8L, did manage to get some sound out of it using the PWM output, but 8kB of flash just wasn’t enough for decent audio. A Freetronics LeoStick proved to be the ticket. 32kB flash, USB device support, small form factor, what’s not to like? I ignored the Arduino-compatible aspect and programmed the device directly. Behind the novice-friendly pin names, they’re an ATMega32U4 with a 16MHz crystal. I knocked up a quick prototype that just played a sound repeatedly. It sounded a bit like a crowbar being dropped, but who cares, it was sufficient. Experimenting with low-pass filters I soon discovered that a buffer-amp would be needed, as any significant load on the filter would render it useless. Initially I was thinking along the lines of a LM386, but after reading the datasheet I soon learned that this would not cut it. They are okay for 500mW, but not 2W. I didn’t have any transistors on hand that would do it and still fit in the case, then I stumbled on the TDA 1905. These ICs are actually capable of 5W into 4 ohms if you feed them with a 14V supply. With 9V they produce 2.5W, which is about what I’m after. I bought a couple then set to work with the breadboard. A little tinkering and I soon had one of the horn speakers working with this new amplifier. Plugged into my laptop, I found the audio output to be quite acceptable, in fact turned up half-way, it was uncomfortable to sit in front of. I re-built the circuit to try and make use of the muting feature. For whatever reason, I couldn’t get this to work, but the alternate circuit provided a volume control which was useful in itself. For the line-level audio, there’s no need for anything more fancy than a couple of resistors to act as a passive summation of the left and right channels, however for a microphone and for the LeoStick, I’d need a preamp. I grabbed a LM358 and plugged that into my breadboard alongside the TDA1905. Before long, I had a working microphone preamp working using one half of the LM358, based on a circuit I found. I experimented with some resistor values and found I got reasonable amplification if I upped some of the resistor values to dial the gain back a little. Otherwise I got feedback. For the LeoStick, it already puts out 5V TTL, so a unity-gain voltage follower was all that was needed. The second half of the LM358 provided this. A passive summation network consisting of two resistors and DC-blocking capacitor allowed me to combine these outputs for the TDA1905. One thing I found necessary, the TDA1905 and LM358 misbehave badly unless there’s a decent size capacitor on the 9V rail. I found a 330uF electrolytic helped in addition to the datasheet-prescribed 100nF ceramics. We also need two power rails: a 9V one for the analogue electronics, and a 5V one for the LeoStick. A LM7809 and LM7805 proved to be the easiest way to achieve this. To allow software control of the power, a IRF9540N MOSFET was connected to the 12V input and supplies the LM7809. The gate pin is connected to a wired-OR bus. The bell button and external source switch connect to this bus with signal diodes that pull down on the gate. Two BC547s also have collectors wired up to this bus, one driven from the USB +5V supply, and the other from a pin on the LeoStick. Pressing the Bell button would power the entire circuit up, at which point the LeoStick would assert its power on signal (turning on one of the BC547s) then sample the state of the bell button and start playing sound. When it detects the button has been released, it finishes its playback and turns itself off by releasing the power on signal. Earlier I had prototyped a bell generator, however it wasn’t much use as it just repeatedly made a bell noise regardless of the inputs. To add insult to injury, I had lost the source code I used. I had a closer look at the MCU datasheet, deciding to start from a clean slate. The LeoStick provides its audio on pin D11, which is wired up to Port B Pin 7. Within the chip, two possible timers hook up: Timer 0, which is an 8-bit timer, and Timer 1, which is 16-bits. Both are fed from the 16MHz system clock. The bit depth affects the PWM carrier frequency we can generate, the higher the resolution, the slower the PWM runs. You want the PWM frequency as high as possible, ideally well above 20kHz so that it’s not audible in the audio output, and obviously well above the audio sampling rate. At 16MHz, a 16-bit timer would barely exceed 240Hz, which is utterly useless for audio. A 10-bit timer fares better, with 15kHz, older people may not hear it but I certainly can hear 15kHz. That leaves us with 8-bits which gets us up to 62kHz. So no point in using Timer 1 if we’re only going to be using 8-bits of it, we might as well use Timer 0. Some of you familiar with this chip may know of Timer 4, which is a high-speed 10-bit timer fed by a separate 64MHz PLL. It’s possible to do better quality audio from here, either running at 10-bits with a 62kHz carrier, or dropping to 8-bits and ramping the frequency to 250kHz. Obviously it’d have been nice, but I had already wired things up by this stage, so it was too late to choose another pin. Producing the output voltage is only half the equation though: once started, the PWM pin will just output a steady stream of pulses, which when low-passed, produces a DC offset. In order to play sound, we need to continually update the timer’s Capture Compare register with each new sample at a steady rate. The most accurate way to do this, is to use another timer. Timer 3 is another 16-bit timer unit, with just one capture compare output available on Port C pin 3. It is an ideal candidate for a timer that has no external influence, so it gets the job of updating the PWM capture compare value with new samples. Timer 1 is connected to pins that drive two of the three LEDs on the LeoStick, with Timer 4 driving the remaining one, so if I wanted, I could have LEDs fade in and out with it instead of just blinking. However, my needs are basic, and I need something to debounce switches and visibly blink LEDs. So I use that with a nice long period to give me a 10Hz timer. Here is the source code. I’ll add schematics and other notes to it with time, but the particular bits of interest for those wanting to incorporate PWM-generated sound in their AVR projects are the interrupt routine and the sound control functions. To permit gapless playback, I define two buffers which I alternate between, so while one is being played back, the other can be filled up with samples. I define these on line 139 with the functions starting at line 190. The interrupt routine that orchestrates the playback is at line 469. When sound is to be played, the first thing that needs to happen is for the initial buffer to be loaded with samples using the write_audio function. This can either read from a separate buffer in RAM (e.g. from USB) or from program memory. One of the options permits looping of audio. Having loaded some initial data in, we can then call start_audio to set up the two timers and get audio playback rolling. start_audio needs the sample rate to configure the sample rate timer, and can accept any sample rate that is a factor of 16MHz (so 8kHz, 16kHz up to 32kHz). The audio in this application is statically compiled in, taking the form of an array of uint8_t‘s in PROGMEM. I initially had a look around to see if I could get a suitable sound effect. This proved futile, I was ideally looking around for a simple openly-licensed audio file. Lots of places offered something, but then wanted you to sign up or pay money. Fine, I can understand the need to make a quid, and if I were doing this a lot, I’d pay up, but this is a once-off. Eventually, I found some recordings which were sort of what I was after, but not quite. So I downloaded these then fired up Audacity to have a closer look. Bicycle bells have a very distinctive sound to them, and are surprisingly complicated. I initially tried to model it as an exponentially decaying sinusoid of different frequencies, but nothing sounded quite right. So somewhat bell-like. To reduce the space, I use a sample rate of 6.4kHz. I did try a 4kHz sample rate but was momentarily miffed at the result until I realised what was going on: the bell was above the Nyquist frequency at 4kHz, 6.4kHz is the minimum practical rate that reproduces the audio. I used Audacity to pick a point in the waveform for looping purposes, to make it sound like a bell being repeatedly struck. Your easiest bet would be to either figure out how to read WAV files (in Python: wave module), or alternatively, convert to raw headerless audio files, then code up a script that reads the file one byte at a time. The Python scripts I’ve provided might be a useful starting point for generating the C files. Alternatively, you can try interfacing a SDCard and embedding a filesystem driver and audio file parser (not sure about WAVE but Sun Audio is easily parsed), this is left as an exercise for the adventurous. I’ll put schematics and pictures up soonish. I’m yet to try mounting the whole set up, but so far the amplifier is performing fine on the bench. Earlier this week I had an idea. We’ve got an old clock radio that picks up interference from the fridge when it turns on and the buttons on it are starting to fail with age. So the requirements are simple. We need a real-time clock, display driver, and of course, a receiver. The unit we have spends most of its time tuned to 792kHz AM (4QG or “ABC Radio National”), so a simple direct conversion receiver was what I was thinking of. But what about the LO? Now I do have some clock radio ICs that implement the timing circuitry, alarm function and LED panel driver somewhere in a junk box. You feed them with the 50Hz or 60Hz waveform that comes out of the transformer and they use that as the timing source. Easy to use a 555 timer for the time source, and I’d make a traditional receiver. Another option is to use a AVR microcontroller, I have a few ATMega8Ls in the junk box with a NXP I2C RTC chip which I also have a few of. The ATMega8L has a couple of PWM channels one 16-bit and one 8-bit: could they be used as an LO? So: after digging around and locating my bought-years-ago and not-yet-used AVR programmer, and dusting off a breadboard that had an ATMega8L on it from a previous experiment I set to work. This page explains in good detail how the PWM channels work. I started with those examples as a guide and tweaked from there. For the PWM channel to work as a receiver LO, I want it to cover 540kHz to ~2MHz, with reasonable granularity. Question is, how far can I crank this? I have a 4MHz crystal, not the fastest I can use with this chip, but the absolute top of the range for the ATMegas isn’t much higher: 16MHz or maybe 20MHz. So if you’ve got a 16MHz crystal, you can expect to quadruple what I do here. The yellow waveform there is off one of the crystal pins. The cyan one is the PWM pin output, which in this case is a software driven GPIO. Even if this one worked, you wouldn’t want to do it this way unless your chip was doing only this task, and who’d use a programmable chip like an ATMega8L for that? Bump it up one, and it sinks to 600kHz. Way too coarse for what I want sadly. I guess I was hopeful, but maybe the above might serve as a useful spring-off point for experiments with PWM.